The first book on the Māori language was written by Anglican missionary Thomas Kendall in 1815, only a few months after he first began work in the Bay of Islands. 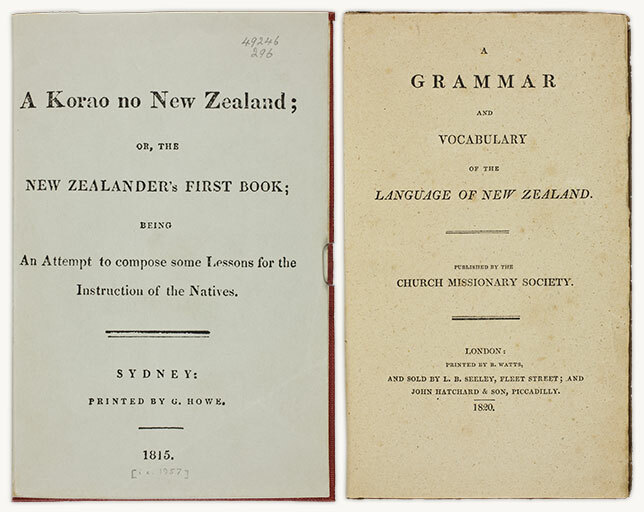 The full title was A korao [kōrero] no New Zealand; or, the New Zealander's first book; being an attempt to compose some lessons for the instruction of the natives. Two hundred copies were printed in Sydney by missionary Samuel Marsden in 1815. Only one of these copies is known to survive. In 1820 Kendall completed A grammar and vocabulary of the language of New Zealand, with the help of a Cambridge professor of languages, Samuel Lee, and the chiefs Hongi Hika and Waikato. This was published in Britain by the Church Missionary Society, but, like Kendall's earlier book, was very basic and full of errors. Four years later the New Zealand missionaries 'condemned the book called The Grammar'.